That’s since the beginning of the recession. Moira Murphy from the 'We're Not Leaving' campaign during a protest last year. 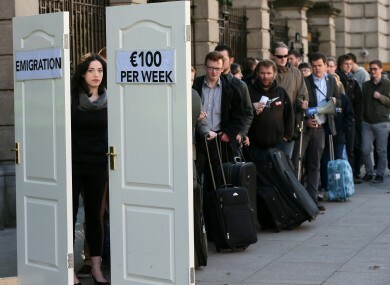 THE NUMBER OF Irish graduates leaving Ireland to seek work has more than doubled since the beginning of the recession. Of the class of 2008, about 5% were employed overseas. The corresponding figure for 2013 has increased to 12%. A study by the Higher Education Authority (HEA) also found that the proportion of the graduate group employed in Ireland has fallen from 42% in 2012 to 39% last year. However, the body could not pinpoint if people were leaving by choice or necessity. Altogether, more than half of those who graduated in 2013 now have employment. The majority of the remainder continued in academia. Just 6% were actively looking for a job, while 3% were “unavailable” for work or further study. Many of these are taking a ‘gap year’ and travelling. The research shows that more females than males were able to find a job – but the entry salary for men is still higher than that for women. Computer science graduates are the most employable group with a massive 77% success rate nine months after graduation. Despite dropping levels of the past five years, education fields are the next highest in terms of employment rates – but there is also a significant proportion of those graduates working overseas. Compounding issues for new teachers, the HEA says that of those employed in Ireland, 64% are only in temporary, substitute or part-time jobs. Just 4% are in permanent or whole-time teaching, while 3% are employed in other work. At 17% employed overseas, teaching is above the average of other vocations. There has been a significant increase in such graduates teaching abroad over the last 5 years, going up from 1% in 2009. Headlines today spoke of ‘brain drain’ but the HEA’s chief executive Tom Boland said he would not be that negative. He emphasised that the study did not differentiate between those who had to move away for work and those who wanted to. “There are positives here as well,” he added. “One positive is, it is quite clear that our higher education system is still graduating graduates of very high quality, which are highly in demand internationally. Email “Number of Irish graduates going abroad to get work more than doubles”. Feedback on “Number of Irish graduates going abroad to get work more than doubles”.